This tree is grown for its branches more than anything else—which are great for winter interest. They're lovely with the leaves attached, but once the branches are bare you can see more easily how, wiry and twisted, they curl against the sky. This is a fast-growing tree and an easy accent. 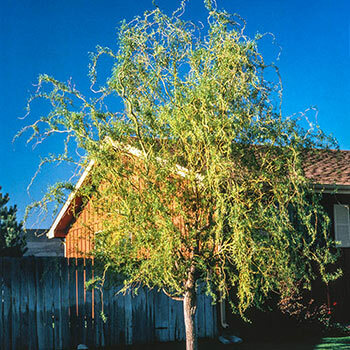 It's a wet area problem solver because this tree loves its moisture—it even thrives in a water garden. It'll tolerate a wide range of soils too, it can even grow in dry soil when properly established. An extra benefit of these gorgeous branches, you can clip them either alone for modern décor—home goods retailers sometimes sell these—or aiding in the architecture of your flower arrangements. Soil Requirements: Tolerant of many soil types. More dry site tolerant than other willows. Tolerant of wet soils. Pruning: Annual pruning will encourage multiple contorted stem production. Late winter to very early spring. Winter Care: None except to mulch the first winter if fall planted. Remove early in spring.